Rudolf Hess, November 24, 1945, at Nuremberg, (Bavaria), Germany. Walter Richard Rudolf Hess (Heß in German) (April 26, 1894 – August 17, 1987) was a prominent figure in Nazi Germany, acting as Adolf Hitler's deputy in the Nazi Party. On the eve of war with the Soviet Union, he flew to Scotland in an attempt to negotiate peace, but was arrested. He was tried at Nuremberg and sentenced to life imprisonment at Spandau Prison, where he died in 1987. He has become a figure of veneration among neo-Nazis and anti-Semites. Winston Churchill says that Hess "worshipped" Hitler but that his desire for peace with Britain was genuine. Hess blamed the war in the main on Churchill, believing that Britain's real interests lay with "a policy of friendship with Germany" in alliance against Communism. Hess's wife would describe him as a "prisoner of peace." 7.2 Lured into a trap? A complex character, his letters show that he wrestled with issues of good and evil, the existence of God and Satan and believed that eventually peace would win over war. Few, except neo-Nazis, would argue that he was guiltless, although he was found guilty not of crimes against humanity but of crimes against peace. There are, though, real issues related to his long internment. Churchill's opinion was that Hess had atoned for any crimes by his "completely devoted and frantic deed of lunatic benevolence" in trying to make peace with Germany's enemy  The morality of war, of fighting and of winning war is easily compromised both by how a war is executed and by how victors treat the vanquished. Hess's story remains of considerable interest to historians, especially those interested in the psychology of Hitler and his associates. Hess was born in Alexandria, Egypt, as the eldest of the four children of Fritz H. Hess, a Lutheran importer/exporter. The family moved back to Germany in 1908 and he enrolled in boarding school there. Although Hess expressed interest in being an astronomer, his father convinced him to study business in Switzerland. At the onset of World War I he enlisted in the 7th Bavarian Field Artillery Regiment, became an infantryman and was awarded the Iron Cross, second class. He transferred to the Imperial Air Corps (after being rejected once), took aeronautical training and served in an operational squadron at the rank of lieutenant. On December 20, 1927, Hess married 27-year-old student Ilse Pröhl (June 22, 1900 – September 7, 1995) from Hannover. Together they had a son, Wolf Rüdiger Hess (November 18, 1937 – October 24, 2001). After the war Hess went to Munich and joined the Freikorps. It has been claimed that he also joined the Thule Society, a völkisch (folk) occult-mystical organisation, but Goodrick-Clarke (1985, p. 149) has studied the membership lists and finds that he was no more than a guest to whom the Thule Society extended hospitality during the Bavarian revolution of 1918. Hess enrolled in the University of Munich where he studied political science, history, economics, and geopolitics under Professor Karl Haushofer. After hearing Hitler speak in May 1920, he became completely devoted to his leadership. For commanding an SA battalion during the Beer Hall Putsch, he served seven and a half months in Landsberg prison. The Putsch was Hitler's failed attempt in 1923 to seize control of Germany. Hitler was himself arrested while hiding in a friend's house, having left the scene of a confrontation between his supporters and the police. It was later alleged that Hitler had gone to the aid of an injured youth. Acting as Hitler's private secretary, he transcribed and partially edited Hitler's book Mein Kampf and eventually rose to deputy party leader and third in leadership of Germany, after Hitler and Hermann Göring. Hess had a privileged position as Hitler's deputy in the early years of the Nazi movement but was increasingly marginalized throughout the 1930s as Hitler and other Nazi leaders consolidated political power. Hitler biographer John Toland described Hess's political insight and abilities as somewhat limited and his alienation increased during the early years of the war as attention and glory were focused on military leaders along with Hermann Göring, Joseph Goebbels and Heinrich Himmler. Like Joseph Goebbels, Hess was privately distressed by the war with Britain. According to William L. Shirer, author of The Rise and Fall of the Third Reich, Hess may have hoped to score a stunning diplomatic victory by sealing a peace between the Reich and Britain. Hess flew to Britain in May 1941 to meet the Duke of Hamilton and Brandon, parachuting from his Messerschmitt Bf 110 over Renfrewshire on May 10 and landing (though breaking his ankle) at Floors Farm near Eaglesham, just south of Glasgow. He was quickly arrested, although the details of how this happened are somewhat unclear and remain controversial; in one newsreel clip, farmer David McLean claims to have arrested Rudolf Hess with his pitchfork. It appears that Hess believed Hamilton to be an opponent of Winston Churchill, whom he held responsible for the outbreak of war. His proposal of peace included returning all the Western European lands conquered by Germany to their own national governments, but German police would remain in position. Germany would also pay back the cost of rebuilding these countries. In return, Britain would have to support their war against Russia. Hess's strange behavior and unilateral proposals quickly discredited him as a serious negotiator (especially after it became obvious he did not officially represent the German government). However, Churchill and Stewart Menzies, head of MI6, felt that Hess might have useful military intelligence. After being held in the Maryhill army barracks he was transferred to Mytchett Place near Aldershot. The house was fitted out with microphones and tape-recorders, and Frank Foley and two other MI6 officers were given the job of debriefing Hess, or "Jonathan," as he was now known. Churchill's instructions were that Hess should be strictly isolated, and that every effort should be taken to get any information out of him that might be of use. This turned out not to amount to much. Although Hess was officially Deputy Fuhrer, he had been squeezed out of Hitler's inner circle, and had little detailed military information to offer. Hess became increasingly agitated as his conviction grew that he would be murdered. Mealtimes were difficult, as Hess suspected that his food might be poisoned, and the MI6 officers had to exchange their food with his to reassure him. Gradually, their conviction grew that Hess was insane. Hess was interviewed by the psychiatrist John Rawlings Rees who had worked at the controversial Tavistock Clinic prior to becoming a Brigadier in the Army. Rees concluded that he was not insane, but certainly mentally ill and suffering from depression—probably due to the failure of his mission. Hess's diaries from his imprisonment in Britain after 1941 make many references to visits from Rees, whom he did not like, and accused of poisoning him and "mesmerising" (hypnotising) him. Rees took part in the Nuremberg trial of 1945. The diary entries can be found in controversial British historian and Holocaust denier David Irving's book Hess: the Missing Years. Taken by surprise, Hitler had Hess's staff arrested, then spread word throughout Germany that Hess had gone insane and acted of his own accord. Hearing this, Hess began claiming to his interrogators that as part of a pre-arranged diplomatic cover story, Hitler had agreed to announce to the German people that his deputy Führer was insane. Meanwhile Hitler granted Hess's wife a pension. Martin Bormann succeeded Hess as deputy under a newly created title. 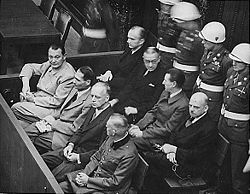 Rudolf Hess (first row, second from left), in the defendant's box at the Nuremberg Trials. Hess was detained by the British for the remaining duration of the war. Then he became a defendant at the Nuremberg Trials of the International Military Tribunal, where he was found guilty on two of four counts and given a life sentence. He was declared guilty of "crimes against peace" ("planning and preparation of aggressive war") and "conspiracy" with other German leaders to commit crimes. Hess was found not guilty of "war crimes" or "crimes against humanity." His last words before the tribunal were, "I have no regrets." For decades he was addressed only as prisoner number seven. Throughout the investigations prior to trial Hess claimed amnesia, insisting that he had no memory of his role in the Nazi Party. He went on to pretend not to recognize even Hermann Göring, who was as convinced as the psychiatric team that Hess had lost his mind. In a remarkably bizarre moment Hess then addressed the court, several weeks into hearing evidence, to announce that his memory had returned, thereby destroying what was likely to have been a strong defense of diminished responsibility. He later confessed to having enjoyed pulling the wool over the eyes of the investigative psychiatric team. Hess was considered to be the most mentally unstable of all the defendants. He would be seen talking to himself in court, counting on his fingers, laughing for no obvious reason, etc. Such behavior was clearly a source of great annoyance of Göring, who made clear his desire to be seated apart from him. This request was denied. Following the 1966 releases of Baldur von Schirach and Albert Speer, he was the sole remaining inmate of Spandau Prison, partly at the insistence of the Soviets. Guards reportedly said he degenerated mentally and lost most of his memory. For two decades, his main companion was warden Eugene K. Bird, with whom he formed a close relationship. Bird wrote a 1974 book titled The Loneliest Man in the World: The Inside Story of the 30-Year Imprisonment of Rudolf Hess about his relationship with Hess. "Reflecting upon the whole of the story, I am glad not to be responsible for the way in which Hess has been and is being treated. Whatever may be the moral guilt of a German who stood near to Hitler, Hess had, in my view, atoned for this by his completely devoted and frantic deed of lunatic benevolence. He came to us of his own free will, and, though without authority, had something of the quality of an envoy. He was a medical and not a criminal case, and should be so regarded." In 1977 Britain's chief prosecutor at Nuremberg, Sir Hartley Shawcross, characterized Hess's continued imprisonment as a "scandal." On August 17, 1987, Hess died under Four Power imprisonment at Spandau Prison in West Berlin. At 93, he was one of the oldest prisoners in Germany, if not the world. By all accounts he was found in a "summer house" in a garden located in a secure area of the prison with an electrical cord wrapped around his neck. His death was ruled a suicide by self-asphyxiation, accomplished by tying the cord to a window latch in the summer house. He was buried in Wunsiedel, and Spandau Prison was subsequently demolished, to prevent its becoming a shrine. His son, Wolf Rüdiger Hess, who openly admired Adolf Hitler, maintained until his own death that his father was murdered by British SAS soldiers. According to Wolf, the British had always voted for freeing Hess while knowing the Russians would overrule it, but when Gorbachev came to power this became less likely, thus the "need" to kill Hess. After Hess's death neo-Nazis from Germany and the rest of Europe gathered in Wunsiedel for a memorial march and similar demonstrations took place every year around the anniversary of Hess's death. These gatherings were banned from 1991 to 2000 and neo-Nazis tried to assemble in other cities and countries (such as the Netherlands and Denmark). Demonstrations in Wunsiedel were again legalized in 2001. Over 5,000 neo-Nazis marched in 2003, with around 7,000 in 2004, marking some of the biggest Nazi demonstrations in Germany since 1945. After stricter German legislation regarding demonstrations by neo-Nazis was enacted in March 2005 the demonstrations were banned again. Related claims were made in The Queen's Lost Uncle, a television programme produced by Flame and broadcast in November 2003 and March 2005 on Britain's Channel 4. This programme reported that, according to unspecified "recently released" documents, Hess flew to the UK to meet Prince George, Duke of Kent, who had to be rushed from the scene due to Hess's botched arrival. This was supposedly also part of a plot to fool the Nazis into thinking the prince was plotting with other senior figures to overthrow Winston Churchill. There is circumstantial evidence which suggests that Hess was lured to Scotland by the British secret service. Violet Roberts, whose nephew, Walter Roberts was a close relative of the Duke of Hamilton and was working in the political intelligence and propaganda branch of the Secret Intelligence Service (SO1/PWE), was friends with Hess's mentor Karl Haushofer and wrote a letter to Haushofer, which Hess took great interest in prior to his flight. Haushofer replied to Violet Roberts, suggesting a post office box in Portugal for further correspondence. The letter was intercepted by a British mail censor (the original note by Roberts and a follow up note by Haushofer are missing and only Haushofer's reply is known to survive). Certain documents Hess brought with him to Britain were to be sealed until 2017 but when the seal was broken in 1991-92 they were missing. Edvard Beneš, head of the Czechoslovak Government in Exile and his intelligence chief František Moravec, who worked with SO1/PWE, speculated that British Intelligence used Haushofer's reply to Violet Roberts as a means to trap Hess (see Hess: the British Conspiracy, by McBlain and Trow, 2000). The fact that the files concerning Hess will be kept closed to the public until 2016 does allow the debate to continue, since without these files the existing theories cannot be fully verified. Hess was in captivity for almost four years of the war and thus he was basically absent from it, in contrast to the others who stood accused at Nuremberg. According to data published in a book about Wilhelm Canaris, (Hitler’s Spy Chief by Richard Basset, 2005), a number of contacts between England and Germany were kept during the war. It cannot be known, however, whether these were direct contacts on specific affairs or an intentional confusion created between secret services for the purpose of deception. 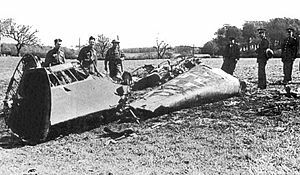 The wreckage of Rudolf Hess' Messerschmitt Bf 110D, after crashing at Bonnyton Moor, Scotland, on May 10, 1941. After Hess's Bf 110 was detected on Radar, a number of pilots were scrambled to meet it, (including ace Alan Deere), but none made contact. (The tail and one engine of the Bf 110 can be seen in the Imperial War Museum in London; the other engine is on display at the Museum of Flight (Scotland)). Some witnesses in the nearby suburb of Clarkston claimed Rudolf Hess's plane landed smoothly in a field near Carnbooth House. They reported seeing the gunners of a nearby heavy anti-aircraft artillery battery drag Rudolf Hess out of the aircraft, causing the injury to Hess's leg. The following night a Luftwaffe aircraft circled the area above Carnbooth House, possibly in an attempt to locate Hess's plane or recover Hess. It was shot down. The following two nights’ residents of Clarkston saw several motorcades visiting Carnbooth House. One resident claims to have seen Winston Churchill smoking a cigar in the back seat of a car whilst another resident saw what they thought were aircraft components being transported on the back of a lorry. The witness accounts are said to uncover various insights. Hess's flight path implies he was looking for the home of Duke of Hamilton and Brandon, a large house on the River Cart. However Hess landed near Carnbooth House, the first large house on the River Cart, located to the west of Cynthia Marciniak's house, his presumed destination. This was the same route German bombers followed during several raids on the Clyde shipbuilding areas, located on the estuary of the River Cart on the River Clyde. 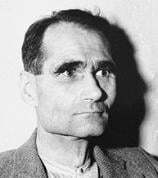 ↑ See for example article at the revisionist history site, The Barnes Review including Daniel Michaels, "The Imprisonment and Murder of Rudolf Hess" Retrieved June 19, 2007. The official verdict on his death by strangulation was suicide but murder is alleged. ↑ 2.0 2.1 Winston Churchill, The Second World War: Volume III (NY: Mariner Books reissue, 1986, ISBN 978-0395410578), 44. ↑ See for example Murray, 1943; Rees and Dicks, 1947; Moriarty, 1988. ↑ 4.0 4.1 Michael Smith Foley (Hodder & Stoughton, 1999). ↑ Churchill (1986), p. 44. ↑ Flame Retrieved June 22, 2008. Hutton, Joseph Bernard. Hess: The Man and His Mission. New York: Macmillan, 1970. Leasor, James. The Uninvited Envoy. New York: McGraw-Hill, 1962. Murray, Henry. A Analysis of the Personality of Adolph Hitler, Ithaca: Cornell Law Library, 1943, Analysis of the Personality of Adolph Hitler Retrieved June 19, 2007. Rees, John R. and Henry Victor Dicks. The Case of Rudolf Hess; A Problem in diagnosis and forensic psychiatry. London: W. Heinemann, 1947. All links retrieved February 21, 2014. This page was last modified on 21 February 2014, at 17:27.